Accepting that an SUV or Crossover will follow established design parameters, stylists within the industry have been able to create some attractive and elegant designs within their brief. KODO (Soul of Motion) is the ethos of Mazda design. Described as capturing the instant that energy becomes motion, KODO provides the Mazda CX-5 with dynamic, attractive, and balanced styling that accentuates the often overlooked sport aspect of the SUV acronym. Where the Mazda CX-5 is athletic, the Nissan Rogue is a rounder, softer, entry. While attractive, the Rogue is understated and borders on conservative, its styling being perhaps best described as urban-sophisticated. Both vehicles are nicely proportioned and will impress whether arriving at the country club or being loaded at the local home building supply store. There are two engine choices available in the Mazda CX-5 (availability by model selected): a standard 2.0 litre 4 (155 hp), and a 2.5 litre 4 (184 hp). Determined by engine choice, Mazda offers a choice of two transmissions, a 6-speed manual and a 6-speed automatic with sport mode. Nissan provides a single engine and transmission choice in the Rogue. Power is provided by a 2.5 litre 4 (170 hp), and is directed to the drive wheels through a continuously variable transmission (CVT). Both vehicles offer an All-Wheel Drive (AWD) option. Transmission preference will be a significant factor when deciding between the Mazda CX-5 and the Nissan Rogue S FWD. Those who enjoy driving will appreciate the versatility of Mazda’s 6-speed automatic with sport mode. The ability to operate as a conventional automatic when in traffic, while allowing the driver to make gear selections when enjoying a favourite stretch of road is both clever and involving. The Nissan CVT is regarded as one of the better examples of this technology. While CVT’s have many advantages (smoothness being first among them), driving enjoyment is rarely mentioned. The leisurely acceleration provided by this type of transmission will frustrate those who expect their vehicle to be engaging to drive. The Mazda CX-5 and the Nissan Rogue both offer comfortable and relaxing cabins. Expectations as to advanced driver aids and safety features are comfortably met in each vehicle. Add in a plethora of entertainment, convenience, and connectivity options and it becomes possible to satisfy the needs of the most discriminating driver. Interior finishing in both vehicles is tastefully accomplished in quality materials that will meet the demands of daily life. The Mazda CX-5 will be the first choice for drivers. Mazda’s SKYACTIV Chassis steering and suspension systems provide the foundation on which to build a surprisingly nimble and agile SUV. The CX-5 will appeal to those who need the space and convenience of an SUV, and still demand an engaging and enjoyable driving experience. Zoom Zoom is much more than a clever advertising campaign. It informs the mindset behind the driving experience offered by the CX-5. Nissan has designed the Rogue to appeal to a different audience. While certainly competent, the Rogue is relaxed and supple, to the degree that it has been described as being almost totally devoid of driver gratification. For a great many buyers, this isn’t a bad thing at all, and the Rogue will find customers who appreciate this mindset. 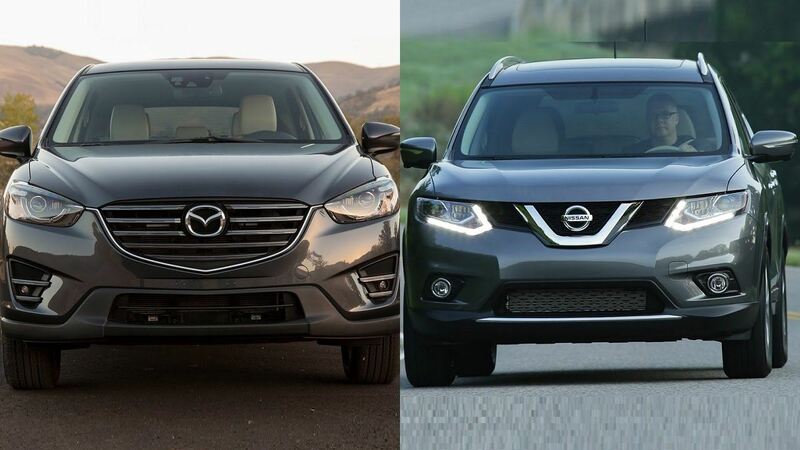 While competing in the Crossover/SUV market, the Mazda CX-5 and the Nissan Rogue share little other than having four wheels. The Nissan Rogue is perhaps closer in spirit to the largely discontinued Minivan. It’s competent, pleasant to look at, and will serve its owner faithfully. The Mazda CX-5 is for those who celebrate the joy of driving, and the adventures to be found on the open road. We invite you to visit Pacific Mazda to test drive the CX-5. We’re confident it’s the first step on your next journey.